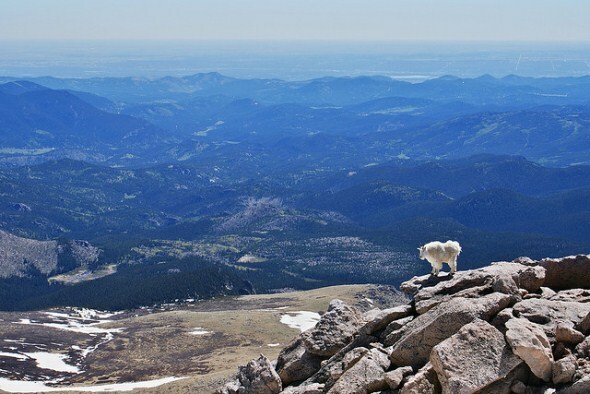 Mount Evans is one of Colorado’s 54 “fourteeners,” peaks that top 14,000 feet in altitude, and it’s both the closest to Denver and the most accessible, thanks to a winding mountain road that is open only in the summer. Mount Evans also is easily seen from Denver, looming in the west. Visitors can drive to a spot that is just a short hike from the mountain’s 14,264-foot summit. The Mount Evans Scenic Byway is the highest road for cars in North America and the upper section generally is open only from Memorial Day to Labor Day because of heavy snow the rest of the year. The 28-mile route to Mount Evans starts on Colorado 103 at the Idaho Springs exit on Interstate 70 about 30 miles west of Denver and continues on Colorado 5. It climbs steadily from Idaho Springs, which is at 7,526 feet in elevation. After 14 miles, Colorado 103 brings visitors to Echo Lake Park, elevation 10,597 feet. The 616-acre subalpine park is part of the Denver mountain parks system and offers trout fishing in the 24-acre lake. There also are picnic areas with views of snowcapped peaks and a stone picnic shelter built in 1937. There is an easy, quarter-mile trail around the lake. Other trails lead into the Mount Evans Wilderness and to the Mount Evans summit. The historic Echo Lake Lodge, a 1926 log building with a four-sided stone fireplace, has a restaurant and gift shop but no lodging. Colorado 5 starts at Echo Lake Park and climbs the remaining 14 miles through the Mount Evans Wilderness. The route passes through alpine forests and across the tundra above timberline, where most visitors see mountain goats and the lucky ones are able to spot bighorn sheep. The road is narrow, with sharp curves and without guardrails. Be sure to watch out for bicyclists. After three miles, the road reaches timberline (11,500 feet) and the Dos Chappell Nature Center, which is operated by the Denver Botanic Gardens and U.S. Forest Service and features exhibits about plants and animals living in the area’s sub-alpine and alpine environments. Outside are bristlecone pines that are 900 to 2,000 years old, many of them bent and twisted by fierce mountain winds. The 1 1/2-mile Walter Pesman Trail runs between the nature center and the upper trailhead in the Mount Goliath Natural Area. Most hikers take it downhill, starting at the upper trailhead, because the trail is rated moderately difficult and covers steep, rocky terrain with a 613-foot gain in elevation. The trail takes hikers across tundra to see ground-hugging wildflowers, including alpine forget-me-nots, fairy primrose, chiming bells and spring beauty, which survive despite having just 40 frost-free growing days. Allow 1 1/2 to 3 hours for a round-trip hike. Study hiking boots and a walking stick are recommended. The botanic garden offers guided hikes that take the trail downhill, and reservations are required. Also accessible from the upper trailhead is an easier, half-mile loop trail that offers wildflower views. After seven more miles, the road reaches the 160-acre Summit Lake Park, also part of the Denver parks system. The lake, at an altitude of 12,840 feet, is in an area carved by ancient glaciers over thousands of years. At the end of the road are panoramic views of the Continental Divide and the ruins of a historic restaurant. A quarter-mile trail climbs 130 vertical feet from the road to the summit of Mount Evans. It’s the first “fourteener” for most visitors. There are three other trails from Summit Lake to the top of Mount Evans, ranging in length from two to five miles, and there is a 14-mile trail from Echo Lake. U.S. forest rangers lead walks at the summit with half-hour to hour-long talks about mountain goats, bighorn sheep, the mountain’s history and tundra ecology. From the summit on a clear day, visitors can see a panorama of mountain peaks from the Never Summer Range on the north to the Sangre de Cristo Mountains on the south. There also are excellent views of three nearby fourteeners, Mount Bierstadt (14,060), Gray’s Peak (14,270) and Torreys Peak (14,267). The weather at the top can be in the 40s in the summer and in the 20s or 30s in the spring and fall (or subtract 10-20 degrees for the wind-chill factor if the winds pick up). Thunderstorms often strike in the afternoons, and snow is possible at any time of the year. The sun also is intense at high altitude, so sunscreen is recommended. Visitors coming from lower elevations should watch for altitude sickness, which can bring headaches, shortness of breath and nausea. Mount Evans was originally named Mount Rosa by one explorer after a Swiss peak and Mount Rosalie by the artist Albert Bierstadt after a woman he would later marry. Bierstadt reportedly climbed to Summit Lake and to the peak’s summit in 1863. The Legislature officially named the peak Mount Evans after John Evans, the Colorado territory’s second governor, in 1895. The road to the summit was built between 1917 and 1927. The project was led by Denver Mayor Robert Speer to open Mount Evans to city residents and tourists, after a road up Pikes Peak began drawing tourists away from Denver. Visitors can take the same route back to Idaho Springs, or they can take Colorado 5 to Echo Lake, then head east on Colorado 103 to Squaw Pass and a route that ends up at Evergreen and I-70, using Clear Creek County Road 103 and Jefferson County Road 66 to Bergen Park and Colorado 74 to Evergreen.